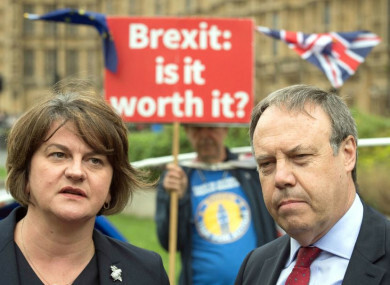 DUP leader Arlene Foster and deputy leader Nigel Dodds pictured in Westminster, London, in September. THE IMPACT OF a no-deal Brexit in terms of trade and business would be “most severe” and last longer in Northern Ireland, according to a document published by the British government. A report released today examines the implications Britain leaving the European Union without a deal would have on business in Northern Ireland and the United Kingdom. The document notes: “Overall, the cumulative impact from a ‘no deal’ scenario is expected to be more severe in Northern Ireland than in Great Britain, and to last for longer. There has been no sitting Assembly in the North for over two years, when power-sharing collapsed over the Renewable Heat Incentive or ‘cash for ash’ controversy. In today’s report, the British government reiterates its commitment to “avoiding a hard border between Northern Ireland and Ireland in any scenario”. It plans to shortly publish further details on its immediate and temporary arrangements for trade between Northern Ireland and the Republic in the event of a no-deal scenario. The report notes that the British government would need to “work urgently” with the Irish government and the EU “to find any sustainable longer term solution”. A no-deal scenario is expected to cause “disruption to closely interwoven supply chains and increasing costs that would affect the viability of many businesses across Northern Ireland”, the British government warns. There is a risk that businesses in Northern Ireland will not have sufficient time to prepare. This could result in business failure, and/or relocation to Ireland with knock-on consequences for the Northern Ireland economy and unemployment. “Northern Ireland is particularly vulnerable given its high proportion of, and reliance upon SMEs (75% of all private sector employment) and the number of businesses who trade directly with Ireland (Northern Ireland’s largest international export market),” the report states. A separate report released earlier this month found that six in 10 small and medium enterprises (SMEs) in the North think Brexit will have a negative impact on their businesses. The British government has warned that several other areas could also be affected, including the single electricity market (SEM), which covers the island of Ireland; cross-border cooperation on crime and security; and the potential for community tensions to be heightened. Groups could seek to exploit gaps in law enforcement and any divergence between Northern Ireland and Ireland, which may lead to increases in smuggling and associated criminality. The British government says it is committed to restoring an Executive in Northern Ireland but warns that this “would become more challenging” in such a scenario. The government has already published predictions of the impact of a no-deal scenario on economies in the North and the UK. This analysis estimates that the UK economy would be 6.3-9% smaller in the long-term (after around 15 years) than it otherwise would have been when compared with today’s arrangements, assuming no action is taken. The report notes that this analysis does not account for any short-term disruptions, which would be likely to have additional short and long-run economic impacts in an immediate no-deal scenario. No modelling can completely capture the complex ways in which the UK economy could be affected by exiting the EU, particularly given the unprecedented circumstances of the UK’s departure. “While the analysis draws on a robust set of tools and evidence, there is an inherent uncertainty around this type of economic analysis. “The results are therefore presented as ranges, and should be interpreted with caution. EU Member States are also expected to face economic risks following a no-deal exit,” the document adds. Speaking in Belfast earlier this month, British Prime Minister Theresa May stated that people living in Northern Ireland and the Republic are understandably “anxious” about Brexit as it is there many of the effects will be most keenly felt. Today she said the House of Commons will hold a series of meaningful votes in the coming weeks to decide what form Brexit will take, including a potential vote on whether to seek to extend Article 50 and delay leaving the EU. May is struggling to get a Brexit deal over the line. The draft Withdrawal Agreement struck between her government and the EU was rejected by the House of Commons by 432 votes to 202 last month. The Democratic Unionist Party, which campaigned in favour of Brexit and props up May’s minority government, believes the backstop threatens the United Kingdom and could lead to a trade border in the Irish Sea. Email “Impact of no-deal Brexit would be 'more severe' and last longer in Northern Ireland than anywhere else ”. Feedback on “Impact of no-deal Brexit would be 'more severe' and last longer in Northern Ireland than anywhere else ”.